Good morning everyone...Today I'd like to talk about a study conducted in 2002 concerning feline lymphoma and secondhand cigarette smoke. The information gathered back then by scientists at Tufts School of Veterinary Medicine and the University of Massachusetts in a study called Environmental Tobacco Smoke and Risk of Malignant Lymphoma in Pet Cats showed a direct link to secondhand smoke and pet cats developing the cancer. The findings of this study was published in the August, 2002 issue of American Journal of Epidemiology, show that cats who live with secondhand smoke are twice as susceptible. Increased feline lymphoma rates may even be as much as 65% greater than a cat living in a smoke-free environment. Figures for a cat living for 5 years in a tobacco smoking home increased to 3x the risk for developing lymphoma. When there are two smokers in a home the rate rises to 4x as likely. Dogs living in a smoking home have a 60% risk of developing lung cancer. The study was conducted at the Tuft Veterinary School's Foster Hospital for Small Animals on a control group of 180 cats. Eighty were treated for lymphoma and 100 for renal failure. This study was very important because before this research it was believed the feline leukemia virus played a major role in which cats would develop this form of cancer. Also in studying cats, it has been determined that more studies are needed on people who smoke developing non-Hodgkins lymphoma. It's been shown that children of smoker's are more likely to develop this form of lymphoma. Studies like this are difficult to prove on humans because of so many environmental factors involved. Now back to the cats. Indoor cats are more susceptible than outdoor cats because they are inside to breathe in the smoke. But the poisons found in tobacco may also be ingested when the cat grooms itself. The cat literally licks off poison attached to it's fur which then enters it's body. People with children, please keep in mind your toddlers may also ingest the poisonous chemicals in tobacco by licking. Not themselves, but their toys. If you've ever wiped down a wall in the home of a smoker you know exactly what I mean. The black soot-like material that comes off on a cloth is the same poison your cat or your child will ingest when licking a surface it has settled on. 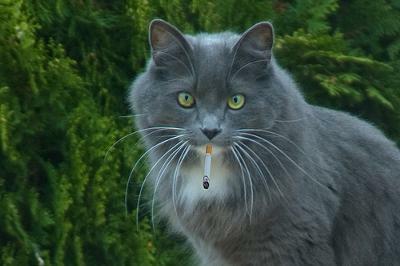 Feline lymphoma isn't the only disease in cats caused by cigarette smoke. Feline asthma, chronic bronchitis, cancer of the mouth (feline oral squamous cell carcinoma) and fibrotic hardening of the lungs are others. Each of these can be looked up online. I won't write a term paper here on this. I also won't list the individual carcinogens or the diseases caused by cigarette smoke. There's simply no good to come from secondhand smoke. End of subject. I hope I've kept this article easy to understand. I chose this subject as it's just as important today as it was in 2002. It doesn't take a scientist to know secondhand smoke is dangerous for everyone. We've known this for years. Personally, I'd never thought of ingestion by licking. Just because the secondhand smoke can't be seen doesn't mean it isn't there. We need to do everything we can to ensure the health of our children and our cats. Unfortunately, when one person in a household smokes, the whole household suffers. I quit smoking over a year ago myself. Just put them down cold turkey the day my best friend was buried after dying of lung cancer. It wasn't easy. I gave "chewing gum" attacks now instead of craving nicotine. I'm glad my kitty cats live in a smoke free environment because I want them with me (healthy) for as many years as possible. Every smoker should be aware of the increased risk of feline lymphoma for indoor cats in smoking households. If you must smoke, go outside and never smoke in the house. Your cat's life may be at risk. Just when I think I know of all the problems that can be caused by smoking something else is brought to my attention. I never thought about how that grimy film in a smoker's house would also be on childrens' toys and cat's fur. Working in the health care field I see a lot of the effects of smoking-- an endless list of preventable health problems from the expected COPD and breathing issues to wounds that will not heal and even amputations because smoking constricts blood vessels. Why is tobacco use even legal? Thanks for posting. I know someone that smokes in a separate room, but doesn't wash his hand after having a cigarette - then pets the cats. That is bad, too. I can smell it on their fur when I go to give them a kiss. Rating ILLNESSES CAUSED BY SMOKING-thank you Elisa! Elisa, I had no idea about; "But the poisons found in tobacco may also be ingested when the cat grooms itself." Thank God I have never smoked!! and the additional information about all the other maladies which smoking can cause to a companion animal; cancer of the mouth, lung cancer, etc. are astounding ! Thank you for another eye opening , informative article. Thank you for this interesting and informative article Elisa. I hope it encourages people to give up smoking. It always amazes me how many young people smoke even though it's well known nowadays how harmful it is to themselves and to everyone else and the pets in their household. There is an excuse for older people who started smoking long before the bad effects of it were discovered and it can't be easy to give up. But having said that, my own late mother smoked and her cats lived long healthy lives, but as you say, it's worse for strictly indoor cats who live in a smoky atmosphere and have no access to fresh air. Hers were indoor/outdoor cats. I’m fascinated how a cat licking plastics could cause lymphoma. Interesting. I have never heard of that before. Cats lick plastic bags because there is some chemical in them that is attractive to cats. That is what I heard.